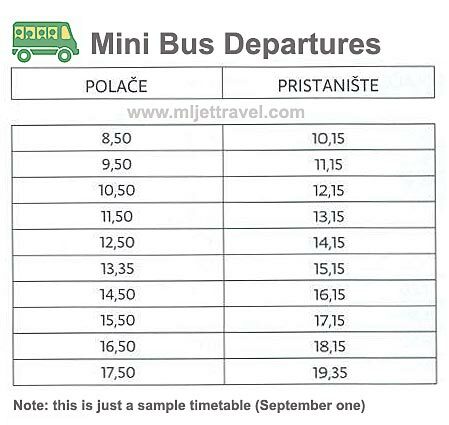 The main public transport on the island are buses (click for timetable) that will take you around the island. Both routes start/end in Sobra, as this it the main ferry port that ferries from/to Dubrovnik and Prapratno are serving all year around. Another good way to travel around is taxis. If you intend to do short distances it is a good idea to rent a bike or scooter (for bit longer distance). There are several bike and scooter renting places on the island, mostly located in the vicinity of National Park. To get to Sveta Marija (St Mary’s) islet you have to get to either Mali Most (walking distance from Pomena) or Pristaniste , the minibus arrival point; once you are there, to reach the islet you can take any of regular ferry boat shuttle service that is departing from there. In the high season there are also some boats running from Soline – check locally when you arrive.